Today’s lecture is going to begin with a quote from Peter Gzowski’s The Game of Our Lives. Like Roch Carrier, whose story “The Hockey Sweater” we’ll read today, Gzowski grew up in the 1940s. He grew up in Ontario and idolized the Leafs, while Carrier grew up in Québec and idolized The Montreal Canadiens. Both Gzowski’s piece here and Carrier’s story focus on the nostalgia adults can have for their early experiences on the ice. To continue setting the tone for today’s content, first watch this ten-minute film “Here’s Hockey” from 1953. This short National Film Board documentary includes some great clips of Jean Beliveau before he joined the Montreal Canadiens. More important for our purposes today, you’ll see clips from a game between the Habs and the Red Wings, where you’ll catch glimpses of Maurice “Rocket” Richard, Gordie Howe, and, pioneering the crouch for which he was so famous, the great Terry Sawchuk, who we’ll read about later in Night Work. You’ll also see kids out learning the game on outdoor rinks. Even when I grew up in Edmonton in the 1970s, outdoor rinks are where many kids learned to play hockey and played their first organized games. Every neighbourhood in my hometown had a local “Community League” building with usually two full hockey rinks. 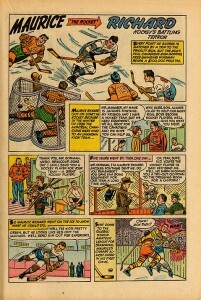 Once you’ve watched the film, read “The Hockey Sweater”. Maurice “Rocket” Richard played right wing for the Montreal Canadiens from 1942 to 1960. The first player ever to score 500 career goals, Richard set many records that would stand for decades to come. He was the first player ever to score 50 goals in fifty games, and scored 965 points in 978 games over the course of his career. 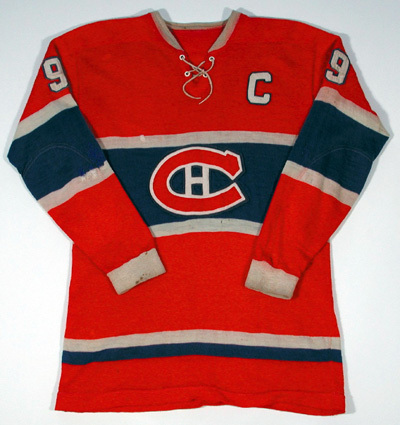 He was captain of the Habs for four of the eight Stanley Cup victories they would win during his career. Rocket Richard’s fierce play, tireless determination, and incredible scoring prowess captured the hearts and imagination of hockey fans everywhere, but especially among his own people. For French-Canadians, Richard became a cultural hero whose influence extended far beyond sports. In a game where the owners and the NHL administration were entirely English, Richard not only led by example, proving that French-Canadians could be the best of the best, he also called out the NHL brass, in particular President Clarence Campbell, for discriminating against French-Canadian players. As the author of a ghost-written column for a Montreal newspaper, Richard wrote in 1954 about the suspension of his teammate Bernie “Boom Boom” Geoffrion and threatened to leave hockey because of what he felt was blatant discrimination against French-speaking players. After Campbell threatened to fine and suspend Richard, he relented and signed a retraction letter. It was during the following season, that one of the most famous events in his career would, as some have argued, help to provoke one of the most important periods of Quebec history, the Quiet Revolution. In March 1955 after a fight in which he eventually punched and knocked out a linesman set off a riot in Montreal, Richard was suspended for the rest of the season and the playoffs while the English player who started the fight received no punishment whatsoever. Seeing this as yet another example of the French-Canadians being treated as second class citizens in their own province, fans rioted after someone threw a tear gas bomb into the crowd at the next Canadiens home game. To return calm to the city, Richard eventually had to come forward and state publicly that he accepted his punishment and would return the following season to help lead the Canadiens to victory. After he retired in 1960, Richard was inducted into the Hockey Hall of Fame in 1961. In 1998, the NHL Board of Governors named in Richard’s honour a new trophy given to the player who scores the most goals in the NHL season. Richard carried his status as an icon of Québec culture throughout his life. When the final game was played at the Montreal Forum in 1996, the crowd gave Richard an incredibly moving 16 minute standing ovation. Although he bravely battled cancer in his final years, he passed away in 2000. Before his funeral, his body lay in state at the Forum. Over 100,000 people came to pay their respects. His state funeral, a sign of his importance in Quebec history, was broadcast live across Canada and was attended by the most powerful people in politics along with some of the greatest living hockey players of all time. As Benoit Melançon’s fascinating book The Rocket: A Cultural History of Maurice Richard illustrates so well, Richard was not only a sports superstar but also a cultural hero. We might think of today’s superstar athletes as being marketed too much with endorsement deals that can dwarf the money they make from playing. Melançon’s book, though, shows us how this pales in comparison to the ways in which Richard was marketed not only in Quebec but throughout Canada and even around the world. His book includes ads for Maurice Richard clothing, and describes Maurice Richard transistor radios, ashtrays, comic books, and soup. Today, Richard continues to be a significant cultural icon. In 2001, the Canadian Mint released a new five-dollar bill that features an excerpt from Roch Carrier’s story “The Hockey Sweater”; the picture on the back of the bill also features a young girl playing hockey with the number 9 on her sweater. A few years later in 2004, the Canadian Museum of Civilization premiered a special exhibit dedicated solely to the legendary player. 2005 saw the releases of The Rocket: The Maurice Richard Story, a very successful and critically acclaimed movie about Richard’s life starring Roy Dupuis. Historians cite the Richard Riot, along with the 1949 strike by Asbestos miners and several other events, as key moments that helped lead to the election in 1960 of the Liberal Government of Jean Lesage. The Liberals helped to bring an end to the close affiliation between the Catholic Church and the repressive, heavily conservative policies of the Union Nationale government. By taking the control of the education and healthcare system away from the Church and by nationalizing control the natural resources of the province (which had previously been owned and developed by companies from outside of Quebec), Lesage’s government helped French-Canadians finally become the “Maîtres chez-nous” (Masters in our own house) the Liberal’s campaign slogan had promised. The massive and rapid culture shift that occurred in Quebec during this time helped to fuel the rise in Quebec nationalism that would later produce separatist movements such as the Parti Québécois who went on to form the Provincial government in 1976 and held two unsuccessful referenda in 1980 and 1995 about whether Québec should separate from the rest of Canada. Written in 1979 and originally published as “Une abominable feuille d’érable sur la glace” (An Abominable Maple Leaf on the Ice), “The Hockey Sweater” has become a classic of Canadian literature. 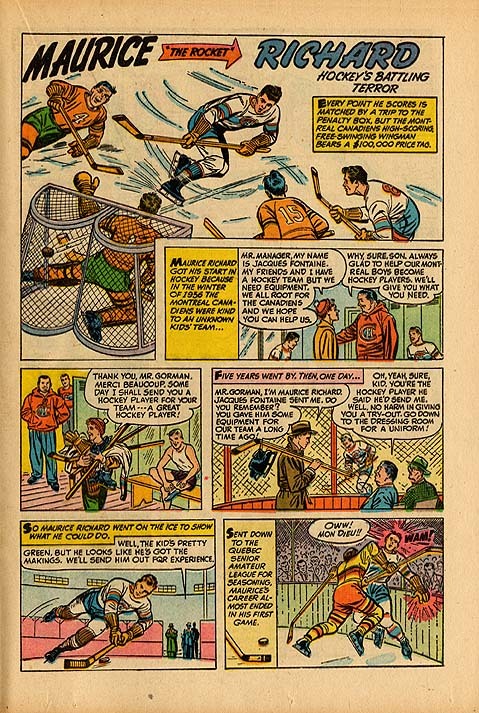 In terms of its themes, the popularity of this story stems in part from the focus on hockey and the universal experience of childhood disappointment. Its vast popularity, however, has also been fuelled by the success of the animated short film based on the story that was released in 1980. “The Sweater” and the accompanying children’s picture book that includes images from the film have been seen and read by millions of children around the world over the last thirty years. After answering a couple of discussion questions, we’ll watch the film and consider some of the differences between the two texts. “The Hockey Sweater,” as you have hopefully begun to see, is about much more than a hockey sweater. In today’s online discussion, we’ll look into the story more deeply. Listen to the following interview in which Carrier discusses how the story came about. It is important to remember that at the time Carrier is writing this story, there is a separatist government in Quebec and the province was on the verge of holding its first referendum to see whether the majority of Quebec wanted to separate from the rest of Canada (40% of the people in 1980 voted “Yes”). Carrier suggests in this clip that instead of writing an essay that directly answered the question “What does Quebec want?” he wound up writing “The Hockey Sweater.” If you look more closely at the story, though, it still tells us a lot, not only about English-French relations but also about the situation of French-Canadians in the mid 1940s. There is more here than just a story about something that happened to Roch as a boy. Directed by Sheldon Cohen, this 1980 animated adaptation of “The Hockey Sweater” is as beloved as Carrier’s story. It has been watched by generations of Canadian children. The Legendary #9: Maurice “Rocket” Richard, footage from the CBC Archives. If you liked “Here’s Hockey,” you might also be interested in watching this 27 minute documentary from 1972 called “Just Another Job.” The film details the Quebec Nordiques and the beginning of their first season in the WHA. They were coached for their first several games by Maurice Richard. Richard quit shortly thereafter, deciding that coaching was really not for him.